Captain Graydon Newman is a 36 year veteran of the Birmingham Police Department. He entered the Birmingham Police Academy on December 13, 1982. After graduation was assigned to the East Precinct. In the following years, he was assigned or been a supervisor in the Tactical Division, Mounted Patrol, Hit and Run, Accreditation Unit, Internal Affairs, the Airport Unit, as well as a supervisor at all four Precincts (North, East, West, South) and the BPD Honor Guard. He has also commanded units, such as the Birmingham Police Academy (Director), Professional Standards (includes Hiring, Payroll, Accreditation, Training), Internal Affairs Division, and Crimes against Property. Additionally, he served as Assistant to the Deputy Chief of Administration. 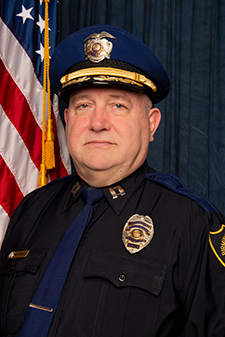 Captain Newman is a graduate of E. B. Erwin High School (Center Point, Alabama), University of Alabama in Birmingham (Bachelor of Arts degree), and Birmingham School of Law (Juris Doctor). He is a member of Alabama Bar Association and am licensed to practice law in local, state, and federal courts.